I had visions of being the ultimate badass chick and changing my own car battery. Yup, ended up holding the flashlight. Ah well, seems an appropriate way to end the month. Oh, October. What a month it’s been. Can’t say I’m terribly sad to see it go. November can only be better, right? That’s what I’m going for. We did get the Halloween decorations up and Alan managed to carve one pumpkin. The Arboretum was visited (unlimited mimosas!! ), eating in a storm was done, and entirely too much money was spent on things we may or may not technically “need”. But, trick or treating will be done tonight, so there’s that. I’ve been super slack about cooking. This week I decided to get back on that and have made two really awesome meals, if I do say so myself. And I do. The first one was paleo meatballs in tomato sauce stuff (that’s a link, click it). I was a little concerned about the amount of garlic, but Alan said it was just fine. While that wasn’t my favorite meal, it’s definitely something that I can add into rotation. Yesterday I made paleo pork roast (another link -yes, Liz, I’m pointing them out for you, click them! ), garlic mashed sweet potatoes (yup, click it), and blackberry cobbler (you know you wanna). At first, all the different smells of the pork roast kept messing with my smeller. After a few hours, however, it smelled amazing. Seriously, so much awesome-smell was happening in my house yesterday. The sweet potatoes, I was a little concerned about. I’ve only ever had them plain or doctored with butter and brown sugar. But, these, oh man. I’m making more of those tonight to go with another new recipe: sausage spaghetti squash bake (surely I don’t have to keep telling you…) I’ve never bought a spaghetti squash until yesterday. Hopefully, I don’t ruin it. I’m kind of excited about this one and hope it comes out as good as it sounds. The blackberry cobbler was…blackberry cobbler, I guess. I’m not a huge fan of blackberries to begin with and the crumble part needed a sweetness to it. Since it wasn’t baked in, we improvised and dumped ice cream all over it. There was a ridiculous amount of amazingness that happened in my kitchen today. 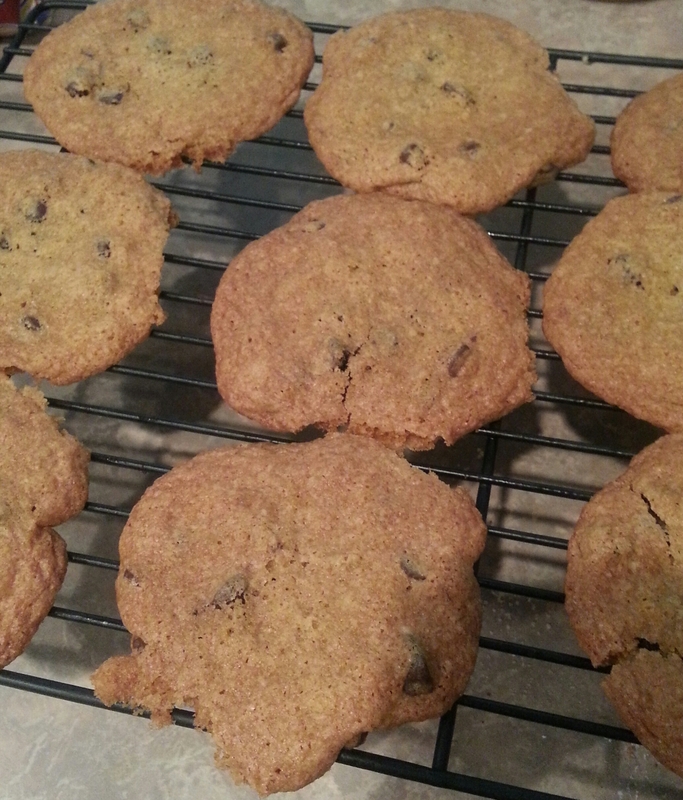 Wheat free chocolate chip cookies. Good ones! I found this blog post on how to make your own all purpose flour to sub into any recipe 1:1. That right there was a win for me. Then, I tried one of the combos in my go-to pancake recipe. Oliver declared them better than his “normal” pancakes. Which is big because if you tell that kid something doesn’t have bread (what we call wheat around here) in it, he automatically doesn’t like it. So, I got to thinking about what else I could try it in. Colin has been a real trooper with giving up wheat. I’ve made several things here and there to try to keep him “in bread”, but things have still been sorely lacking. There’s been a bag of chocolate chips sitting on my counter staring at me for a few weeks, so I figured I’d give the cookie recipe a shot. I’d love to lie and say it was for Colin that I was doing this, but, come on….it’s chocolate chip cookies. This one was totally for me!